Okay, here's my review of the AT TE Walker, bear with me, because this is my first review. (Really the first chance i've had to be the first reviewer). 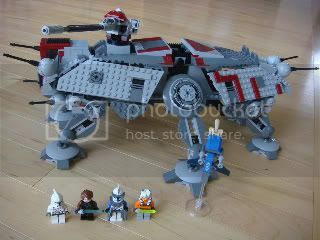 You've probably already seen my thread in LEGO Star Wars, but if not, this set was at my Target this morning, and as it was not supposed to be released yet, I had to grab it. The build is relatively straight-forward, with the whole walker being centered around a frame very similiar to that of the MTT. The legs and side panels were rather monotonous, but not any moreso than any of the other walkers. There really isn't much more to comment on for the build, pretty much just more of the same for walkers. I would give a comparison to the original AT TE, but unfortunately I never had it. The STAP is pretty basic, with only a slight update on the battle-pack design. Here's an overall shot with everything included except the Huttlet. 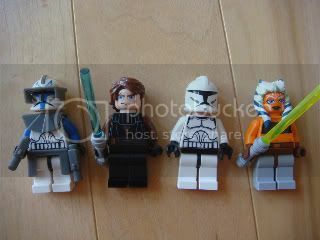 Here's all the minifigs, except for the battle droid....and the Huttlet. clone upgrades, they come in a small bag, so it seems they will be standard in all CW sets. Parts: 8/10-With 799 pieces, I was slightly dissapointed, and thought LEGO could have kept the $89.99 price tag with a few more pieces. Minifigs: 7/10-While the minifigs it comes with are nice (especially the clones) I would have liked 1 more standard clone and 1 more droid, so there are actually enough minifs to have a decent battle scene. 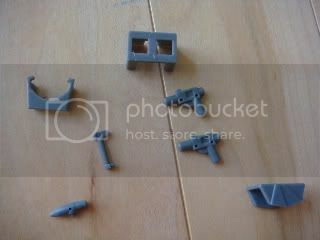 Playability: 6/10-While it has a few play features(two blasters concealed in the front), and slightly moveable legs, this set looks best displayed, sure the moveable turrets are nice, but the leg's "movement" really only allows it to stand in its normal pose, or a straight pose. Price to parts: 7/10-I think this could be ten dollars cheaper, and when I first opened the box, it seemed like it could be thirty dollars cheaper. The parts aren't bad, but they don't let you build much more than this walker. Availability: 2/10- For the time being, although i'm sure on the 26th it will rank 10/10. OVERALL RATING: 8.5/10-A pretty neat set, great for clone armies, and for anyone who never had the first one, I would definately recommend it. Urgh - I don't like the emptiness of the interior. Oh - did you know that your avatar must be bubbly? No I didn't, i'll have to change it. Thanks for telling me. 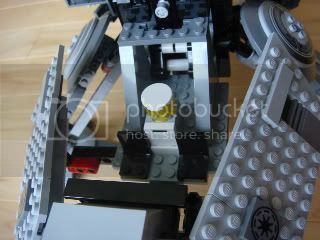 And yeah, I agree about the interior, and then the classic walker gaps. It's not a bad set, but it could use some modding. 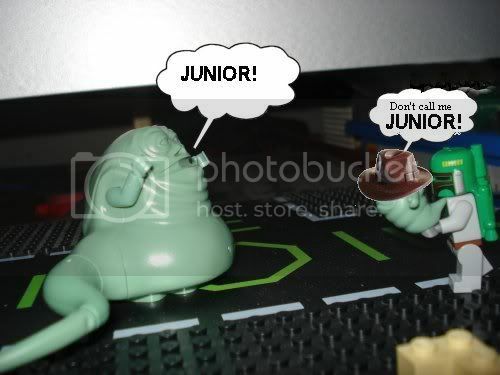 Which is why LEGO is better than Hasbro. Are the Clone Helmets 3D, or flat curves? Flat Curves, with the details printed on, with is nice for making custom helmet decals, although it isn't quite as nice as 3d helmets. Oh well. Could you please post the pictures on here? Unfortunately my computer has a blocking system on it which doesn't let me go on sites like flickr, photobucket, youtube etc. The whole thing opened up. 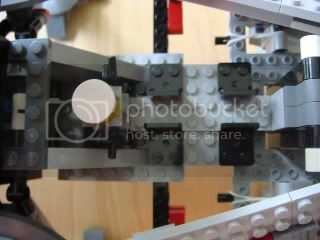 The back interior, it comes out so you can set the minifigs in more easily, and features a rack for 4 guns, and a small power generator type thing. The Front interior. This has 2 chairs, a removable container with another one of those power generators. I'm thinking they might be lights as well, though. Since it seems strange to have a removable power generator. Tks for the review Tyr Ordus Yeay its really a neat lookink set and I don't really care about the lack of interior. 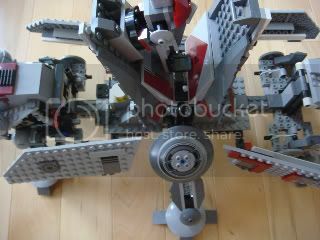 Afterall its Lego and everything can be modded accordingly to one's vision. Where are you from and where did you get that set ? I'm from Omaha, Nebraska, and got it at Target. Or...you could ask your parents to remove the child protection thing they've put on your computer. Yes but the problem is they won't. Know can we get back on topic? Thanks for the informative review, I like this set although it is to expensive for me to buy, unless I get it as a Christmas or Birthday present. The interior of this set is disappointing, but The exterior looks great, very detailed. Hm...a very cool set...it's gunna be a hard decision between this and the RGS. Nice review and by the way, what are the Kamas made of? And do you have to remove them to allow the wearers to sit down? And what is the accessory right below the Rangefinder? All the accessories are made of a stiff plastic, unlike anything else i've seen before. And they do, unfortunately need to be removed for the minifig to sit down, let alone walk. I would assume the thing below the rangefinder is a searchlight of some sort. Btw, how do the extras on the helmet hold ? Are they fix enough or do they have a tendency to fall easilly ? I'm not sure I like all the new accessories for the figures. They're starting to be more action figure-y than Lego minifigs. I think it is good, mainly because it opens up more options for customisation. I'm not crazy about the Kamas, but I really like the way they did the pauldrons. They are a great improvement over the Turbo Tank Commander's pauldron or the Sandtrooper pauldrons (IMO). Im wanting the ATTE way more now thanks to these reviews. The inside is a bit of a bummer but it looks easily fixed with a few extra plates so its not that bad. Good review(s)! Dang you flynn i was gunna post that.